Here at The Wildcat Sanctuary, we’ve made a promise to the cats in our care that they would never be exploited or exhibited for profit again. Before their arrival, so many suffered a great deal of their lives at the hands of unscrupulous exhibitors. It takes such a long time for them to heal emotionally and physically. But, they do heal and they thrive here at our Sanctuary. 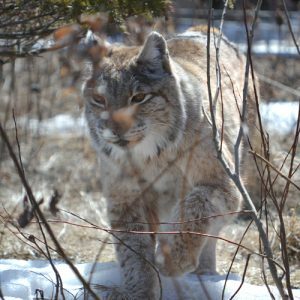 We offer them true peace and tranquility in large, free-roaming habitats nestled in the rural woods of northern Minnesota where they live wild at heart. Yes, not being open for daily tours makes it harder to raise funds to support them. Though it might be easy to open the gates and charge guests for daily tours, it’s a commitment we made to the cats when they arrived that we wouldn’t do that. We understand that many other sanctuaries provide tours and educational opportunities to help support their operations and help educate future generations. Each sanctuary determines what is best for their residents, and ours was to find other ways to support them. Thanks to our supporters and sponsors, we’ve been able to. They know that we’ve taken the road less traveled, not opening up our Sanctuary for daily visitation, and they appreciate how we honor our cats’ lives this way – and they give to help the cats live the quiet, restorative life they so desperately need. The following are just a few of the reasons why we don’t exhibit our cats. But, in reality, there are 100+ reasons why – and they all have a name and story, too. As a cub, Nikita was taken from her mother far too young and chained down day after day so people could take pictures with her. Her owner, a notorious breeder, exhibitor, and ex-convict, had a long history of abusing animals. He had been in prison for cocaine and steroid trafficking, was arrested for illegal gun possession and sentenced to court-ordered anger management. He claimed to have been arrested hundreds of times. To him, Nikita was nothing more than a way to make money. And when she grew too big to display, she was relegated to a small, concrete-floored cage she had to share with another tiger. Every day was a struggle, fighting for her food. It’s taken a lot of tender loving care for her to learn to trust that no harm will ever come to her, and that she will never again have to earn her keep. Max was owned by an exhibitor who took him to schools and other events for show. Many exhibitors claim this is a great way to educate kids about conservation but studies show this is far from true. Instead, it undermines conservation since children assume it’s acceptable for wild animals to be caged and carted around for display and entertainment. The U.S. 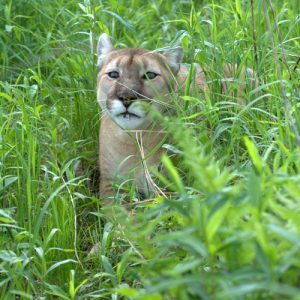 Fish and Wildlife Service has said it has “sincere doubts” about the conservation benefits from public exhibitions of wildlife and no longer accepts “education” as a basis for issuing Endangered Species Act permits. Long ago, Max made it quite clear he wasn’t interested in the leash or the exhibit profession. He was then “retired” to The Wildcat Sanctuary but, to this day, he will still growl at the sight of anything resembling a leash. The memory of his former life stays with him and we assured him he’d never have to endure that again. 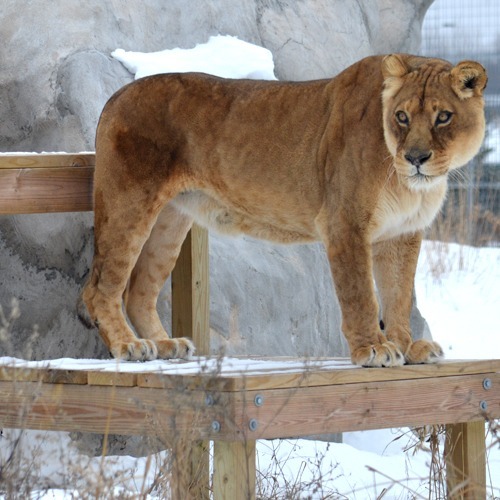 Tasha spent the first 9 years of her life locked in a garage at a residential petting zoo. She was used for breeding until, one day, she escaped through a hole in the roof. Her owner didn’t report her escape, fearful Tasha would be killed. But Tasha did finally return, scared and hungry. She was taken by authorities and went to live at another backyard rescue facility in a small 10×20 cage. Once regulations were tightened in Ohio, Tasha finally came to live at her forever home here at The Wildcat Sanctuary. As with so many cats we’ve rescued, Tasha’s journey was long and hard before she finally found the peace and tranquility of a true sanctuary. She thrives in the large, natural free-roaming habitat here at the Sanctuary. Ekaterina’s notorious exhibitor was featured years ago in an expose aired by ABC’s investigative show 20/20. 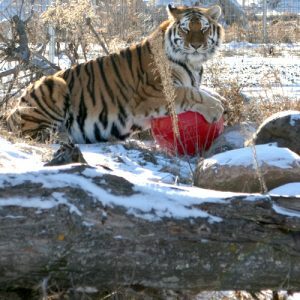 She would allow paying customers to go into the animal enclosures to pet, photograph and even sit on the tigers or bears who had been declawed and often defanged. Chained down, they had no choice but to comply. When stories of injuries to guests began emerging and after years of violations, authorities finally pursued shutting the facility down permanently. It took the combined efforts of USDA, undercover agents and concerned citizens seven years to shut this exhibitor down. The cats were divided up and sent to various facilities around the country. Ekaterina ended up at a facility in Texas but, unfortunately, they filed bankruptcy and her life was in jeopardy again. 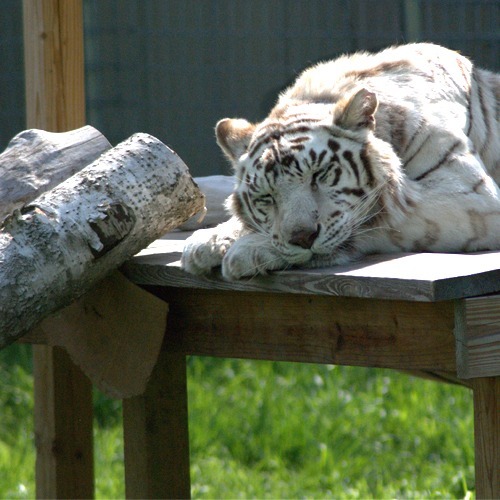 The Wildcat Sanctuary was happy to offer her a forever home where Ekaterina truly lives happily ever after, with no fear of exhibition ever again. When a private zoo, the Catskill Game Farm, closed down after 73 years of exhibiting animals, humane organizations feared for the nearly 1000 animals they’d be auctioning off. They could end up in the hands of unscrupulous dealers, breeders, exhibitors, and hunting facilities. As long as a buyer had the money and transportation, the animals could be theirs. A massive effort was launched to rescue as many as possible from this unknown fate. We knew that a pride of lions would be highly sought after by canned hunting facilities. These ranches are legal and prevalent here in the US and hunters can shoot a prized animal for a hefty price. We hurriedly prepared to rescue as many as we could. The lion pride, Shanti Deva, Asha, and Aslan, came to The Wildcat Sanctuary along with the black leopard Shazam and three mountain lions named Matty, Max, and Mia. All had been used for exhibition. All were being disposed of when the farm decided to shut down. These seven animals deserved a lifelong commitment and deserved to live out their lives safely and well-cared for. They found this at The Wildcat Sanctuary and a promise was made to them, as they came through the gates, that they’d never be put on display again, as they had been, in order to know their lives were safe. Each donation we receive means so much to all the cats here at The Wildcat Sanctuary. We know it means our supporters put the cats’ emotional and physical needs above their own desire to see them in person. It’s a gift from the heart that is appreciated so much by so many here.